Do you live in Kimberley? Hopetown, which was his father's farm. He showed the pebble to his father who sold it. The pebble was purchased from Jacobs by Schalk van Niekerk, who later sold it. It proved to be a 21.25 carat (4.25 g) diamond, and became known as the Eureka. Three years later Schalk van Niekerk sold another diamond also found in the De Kalk (29°3′S 23°58′E) vicinity, the Star of South Africa for £11,200. The second diamond was promptly resold in the London market for £25,000. In 1869, an even larger 83.50 carat (16.7 g) diamond was found on the slopes of Colesberg Kopje on the farm Vooruitzigt belonging to the De Beers brothers. Henry Richard Giddy recounted how Esau Damoense (or Damon), the cook for prospector Fleetwood Rawstone's "Red Cap Party", made the discovery on Colesberg Kopje after he was sent there to dig as punishment. Rawstorne took the news to the nearby diggings of the De Beer brothers — his arrival there sparking off the famous "New Rush" which, as historianBrian Roberts puts it, was practically a stampede. Within a month 800 claims were cut into the hillock which were worked frenetically by two to three thousand men. As the land was lowered so the hillock became a mine – in time, the world renowned Kimberley Mine. The Cape Colony, Transvaal, Orange Free State and the Griqua leader Nikolaas Waterboer all laid claim to the diamond fields. The Free State Boers in particular wanted the area as it lay inside the natural borders created by Orange and Vaal Rivers. Following the mediation that was overseen by the governor of Natal, the Keate Award went in favour of Waterboer, who placed himself under British protection. Consequently, the territory known as Griqualand Westwas proclaimed on 27 October 1871. As miners arrived in their thousands the Hill disappeared and subsequently became known as the Big Holeor, more formally, Kimberley Mine. From mid-July 1871 to 1914, 50,000 miners dug the hole with picks and shovels, yielding 2,722 kg of diamonds. The Big Hole has a surface of 17 hectares (42 acres) and is 463 metres wide. It was excavated to a depth of 240 m, but then partially infilled with debris reducing its depth to about 215 m; since then it has accumulated water to a depth of 40 m leaving 175 m visible. Beneath the surface, the Kimberley Mine underneath the Big Hole was mined to a depth of 1097 metres. A popular local myth claims that it is the largest hand-dug hole on the world, however Jagersfontein Mine appears to hold that record. 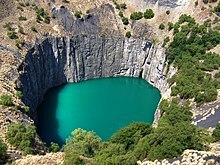 The Big Hole is the principal feature of a May 2004 submission which placed "Kimberley Mines and associated early industries" on UNESCO's World Heritage Tentative Lists. ion, but, after striking a deal with the Home Government and receiving assurances that the local population would be consulted in the process, he passed the Griqualand West Annexation Act on 27 July 1877. A sign next to the Big Hole, reading "If all the diamonds recovered from the Kimberley Mine could be gathered together they would fill three cocopans such as these"
The various smaller mining companies were amalgamated by Cecil Rhodes and Charles Rudd into De Beers, and The Kimberley under Barney Barnato. In 1888, the two companies merged to form De Beers Consolidated Mines, which to this day today still retains a monopoly over the world's diamond market. Very quickly, Kimberley became the largest city in the area, partly due to a massive African migration to the area from all over the continent. The immigrants were accepted with open arms, because the De Beers company was in search of cheap labour to help run the mines. Another group drawn to the city for money was prostitutes, from a wide variety of ethnicities who could be found in bars and saloons. It was praised as a city of limitless opportunity. The shifts from frontier farm names to digger camp names to the established names of the towns of Kimberley and Beaconsfield – which duly amalgamated in 1912 – are outlined above. The only traces of any precolonial settlement within the city's boundaries are scatters of Stone Ageartefacts and there is no record of what the place/s might have been called before the first nineteenth century frontier overlay of farm names. It lay beyond the areas occupied by Tswana people in the precolonial period. Sites such as the nearby Wildebeest Kuil testify to a Khoe–San history dating up into the nineteenth century. Writers from the city or with strong Kimberley links include Diane Awerbuck, Benjamin Bennett, Lawrence Green, Dorian Haarhoff, Dan Jacobson,Z.K. Matthews, Sarah Gertrude Millin, Sol Plaatje, Olive Schreiner, A.H.M. Scholtz. The Big Hole, previously known as the Kimberley Mine Museum, is a recreated townscape and museum, with Big Hole viewing platform and other features, situated next to the Kimberley Mine ("Big Hole"). It houses a rich collection of artefacts and information from the early days of the city. The Miners' Memorial, also known as the Diggers' Fountain, located in the Oppenheimer Gardens and designed by Herman Wald. It was built in honour of all the miners of Kimberley. The memorial consists of five life-sized diggers lifting a diamond sieve.The Honoured Dead Memorial commemorates those who died defending the city during the Siege of Kimberley in the Anglo-Boer War.